Today the S&P500 (see more S&P500 Charts) closed at a new, record all-time closing high. 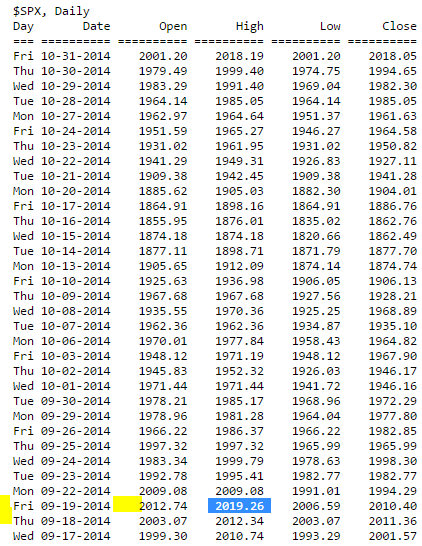 The all-time intraday high was many weeks ago on Friday September 19, 2014. This graph shows the size of the market corrections going back to December 2011. This table adds the data for the Dow, NASDAQ and Russell 2000 indexes. You can see the Dow Jones Industrial Average also closed at an all-time high. This shows the markets in graphical form. Come back Saturday when it should be complete. Lam Research (LRCX Charts and Quote) usually has the best handle on the semiconductor capital equipment industry so I pay attention to what they say. Disclosure: I own LRCX and cover it in my newsletter. Subscribe NOW and get the October 2014 Issue for FREE! ! While we plan to provide more detail on the anticipated 2015 WFE spending level and composition in January, we can’t say today that from industry analysis customer and peer commentary to-date at WFE growth rates in the 5% to 10% would be a reasonable starting assumption. We consider that our opportunity in calendar ‘15 is greater than WFE baseline due to etch and deposition markets growing faster than the average of other segments, combined with the relative strength of our product portfolio and sentiments of customer support for which we are sincerely grateful. The tax rate was 18%, which was up sequentially due to the geographic distribution of revenue for the quarter with more revenue being generated in the United States. Based on a non-GAAP share count of approximately 175 million shares, earnings per share were $0.96, above the midpoint their guided range. On July 2nd, Lam paid a $0.18 per share dividend which consumed $29 million. Lam ended the quarter with cash and short-term investments including restricted cash of about $3 billion. "This is down from $2.2 billion in the June quarter with cash generation in the quarter being more than offset by our ongoing share repurchase and dividend programs." Q2 guidance: "We expect shipments of $1.240 billion plus or minus $50 million. We expect revenue of $1.230 billion plus or minus $50 million. We’re forecasting gross margin of 45.5% plus or minus one percentage point. We forecast operating margins of 19% plus or minus one percentage point. And finally we forecast earnings per share of $1.12 plus or minus $0.07 based on a share count of approximately 173 million shares." I own LRCX and cover it in my newsletter. Subscribe NOW and get the October 2014 Issue for FREE! ! After a 10% correction this month, the S&P 500 is currently at 1964.58, which is only 2.3% below its all-time high. This table adds the data for the Dow, NASDAQ and Russell 2000 indexes. =>This means the decline from intraday high to intraday low is 9.8% and we are currently only 2.7% the all-time record high. 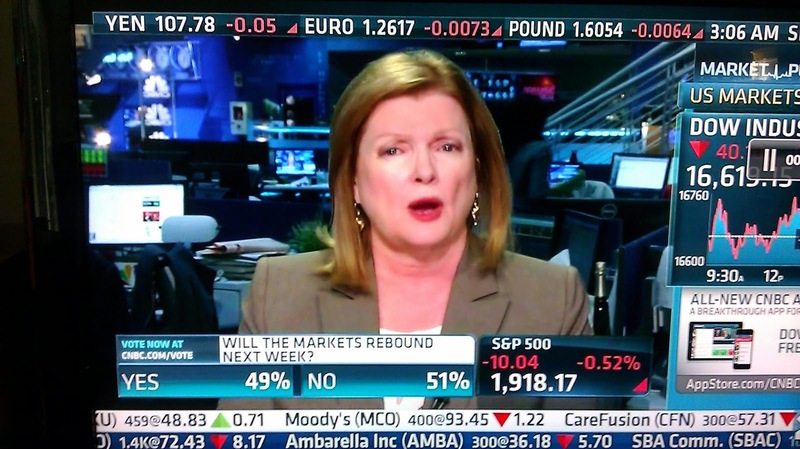 Did you do any buying on the recent 10% weakness? I did! I also sent email alerts to my newsletter subscribers announcing we reached some of my buy targets published in my newsletter as a reminder. Subscribe to my service NOW and get the October 2014 Issue for FREE! ! While the president was busy last week with a fund raising trip to the Bay Area and Los Angeles, it seems two hospital workers who took care of an Ebola patient have contracted the disease. Now they are talking on TV about how the second worker took a plane to travel but since she wasn't vomiting, they don't believe others on the plane are at risk, but it is clear they don't know for sure. Stock markets don't like unknowns and it has sold off to finally hit the 10% level I've written about in my monthly newsletter for a long time. This chart shows the market is at a KEY (ie very important) support level. There is also fear of deflation with most economies across the globe showing lower growth with some in contraction. IF you want to search for good news, some of the stocks I recently added to are green today despite the markets currently down 2% or more. These small stocks led the decline (See blue Russell 2000 on graph) down so they may be signaling a bottom for the next advance... stay tuned as this can change quickly. My newsletter subscribers should watch their inbox for a special "Market Update" email alert later today. 1:05pm pst Update: My explore portfolio closed in the green today and it is up ~1% for the year. Oct 30 Update: Subscribe NOW and get the October 2014 Issue for FREE! ! Oct 31 Update: SPY just hit a new record high!!!! Today the S&P500 Index went below its 200 Day Moving Average, MA(200) or 200DMA, for the first time in almost two years. 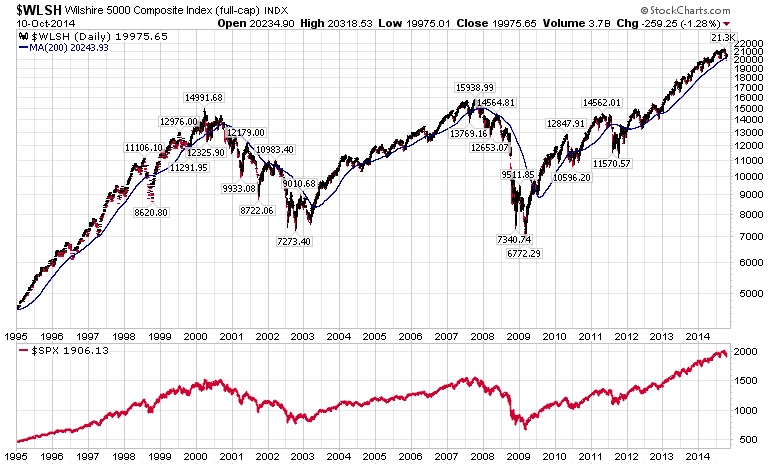 This is one of the longest periods ever without a touch of the 200DMA. Yesterday in Martin Pring's Market Roundup, Pring pointed out it was a 50-year record! Mon. 10/13/14 @ 1:14PM PST Update: Fear & Greed Closed at ZERO! This tells me the index is flawed as it should have the ability to go lower. CNNMoney has a sentiment index called the "Fear & Greed Index." Currently the CNN Fear and Greed index site says it is 1 as of Oct 10 at 4:03pm. This is a record low. Note the time and date on that chart shows Oct 10 at 4:028 pm! I wonder if they backed up the clock to get the lower number for the weekend? Here are charts of the Fear and Greed index, Put/Call ratio, Dow Jones Industrial and S&P500 over time. Not counting dividends, the Dow and Russell 2000 small cap index are down year to date. Market and Sentiment update for today, October 10, 2014. The S&P500 closed today at just a hair above its 200 day moving average. A flat or down open on Monday should cause the first penetration of this 200DMA since November 2012, nearly two years ago! The Russell 2000 small cap index is down 9.24% YTD and is 13.4% below its all-time record high. 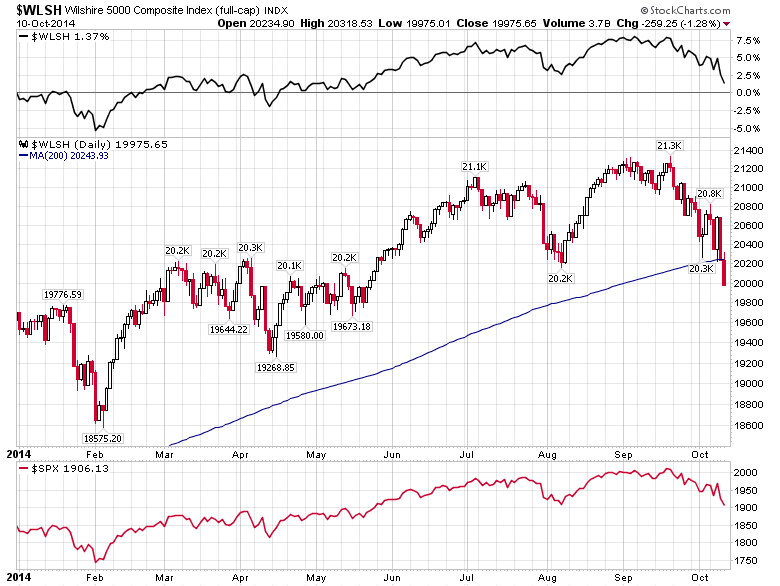 The broad market represented by the Wilshire 5000 index is currently below its 200DMA, the first time since late 2012. The "Fear & Greed Index" hit a record closing low of 2. During the day, CNBC respondents were roughly split when asked if the market would be higher or lower next week. List of companies working on a cure or other drugs to fight Ebola. NanoViricides "has now developed novel nanoviricide drug candidates against Ebola that it believes could lead to a successful therapeutic. These drug candidates are designed to mimic the host cell receptor onto which the Ebola virus binds to cause an infection. The site at which the virus binds does not change, in spite of all the mutations a virus undergoes. Thus the Company believes that its drug candidates would continue to work in spite of field mutations in the virus. This is unlike vaccines, antibodies, siRNA, antisense, and several other therapeutic modes which a virus can readily overcome due to mutations it acquires in the field." ==>"BioCryst last month received a $4 million pact to develop its BCX4430, which it hopes can be used for a wide spectrum of viruses like Ebola. The drug proved helpful in tests on yellow fever patients." Thomas Duncan, the man who lied about his exposure to Ebola in Liberia on his return to the US, was treated with a drug developed by Chimerix Inc.
==>"developing a vaccine that would be injected into healthy individuals to prevent the disease from attacking"
==>"Fujifilm has diversified into chemicals, medical products and pharmaceuticals. Its Toyama Chemical Co. has been contracted out to test an anti-influenza drug on an Ebola patient." ==>"Based in Burnaby, British Columbia, Tekmira’s drug has been used on a number of infected patients, including Richard Sacra, the American missionary who contracted the deadly virus in Liberia." ==>"Garabedian says that its Ebola test program, which he said could be resumed quickly, resulted in a 60% to 80% survival rate when used on test monkeys infected with Ebola. Its Marburg drug has proved 80% to 100% effective. Sarepta used a gene-sequencing technique to come up with its treatment, and Garabedian says it can be easily adapted to treat other diseases. A new gene sequencing matrix to treat Dengue fever using the same technique was developed in 11 days, he said." Ticker Sense Low, Market Corrected 4.7% - Is the Bottom In? Notice on this chart how the S&P500 rebounded sharply after touching the dotted blue support line on my two graphs below. While I think a correction all the way down to the 200 day moving average, MA(200) on my charts, would make for a better, long-term low, I believe we have enough for a short term low now. After taking profits in my positions when the market was hitting record highs, I started adding to my shares again this week with a new buy alert sent to my subscribers on Monday when this Ticker Sense chart indicated a possible low was close. Ticker Sense sentiment is measured weekly and reported on Mondays so it often turns up AFTER a short-term bottom is made. Will the market rally to a new high somewhere below the dashed red resistance lines on my top two graphs then make a bigger correction to the 200 day moving average? You DO NOT NEED TO READ the complete newsletter each month. Starting with the November issue, I will write the new content in black with the content repeated from the past month in blue so you can quickly skip ahead to what is new each month. Here is a snapshot of the index for today. Fear and Greed now down to 3! The second chart below shows this is an all-time record low! The Fear & Greed Index is a summation of seven indicators explained in detail here.